St Patrick's Athletic are back in SSE Airtricity League action on Monday evening when they host Derry City in Inchicore (kick-off 7.45pm). The Saints will be looking to build on last Friday's 1-1 draw away to Cork City in which Harry Kenny's side came from behind with 10 men thanks to a late Dean Clarke equaliser in Turner's Cross. 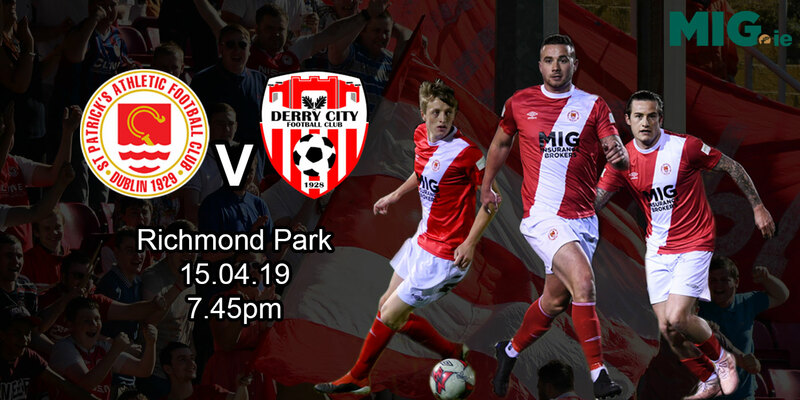 The meeting of Pat's and Derry is the first between the sides in 2019 following the postponement of the original scheduled game between the sides due to both sides having international call-ups. In team news, the Saints are without both Mikey Drennan and Dave Webster through suspension, with Drennan serving the last of his 3 match ban. "I was delighted with the effort and commitment shown by the lads in Cork," Kenny told stpatsfc.com when reflecting on last Friday's 1-1 draw. "We worked incredibly hard throughout the second half and I felt we fully deserved the equaliser at the end from Dean [Clarke]. The lads kept pushing and plugging away and were rewarded at the end." Looking ahead to facing the Candystripes in Richmond Park on Monday night, Kenny admits that the Saints face another tricky game against a side which he rates highly. "Derry have made a good start to the league campaign and picked up a good 3 points away to UCD on Friday. They will travel back down to Dublin to face us and will be confident. Declan Devine is back with them this year and they have a very talented group of young players who will pose us problems." "But our lads are in good form at the moment and we hope that we can show the same quality and commitment that we have seen recently to hopefully pick up another three points in Inchicore."